Pierre's first experience with painting came in 1854 when he took his first job working in a porcelain factory painting designs on fine china. His talent for painting would have assured him a career as a porcelain painter, but the company went out of business four years later. During these years he enjoyed visiting the Louvre to see the works of the French masters. In 1861, Renoir began attending the art studio of Swiss teacher Marc-Gabriel-Charles Gleyer. At the same time Renoir enrolled at the Ecole des Beaux. At the Gleyre's studio Renoir met other young artists, including Camile Pissarro (1830-1903), Paul Cézanne (1839-1906) and Claude Monet (1836-1924). By 1863 the primary group of artists of the Impressionist Era was formed. In 1869 Renoir and Claude Monet worked together to produce the first landscape paintings in the impressionist style. This new style sought to capture the effect of the light on their subject. Because they were painting outside, they painted with bright colors and quick brush strokes, capturing the essentials before the light changed. 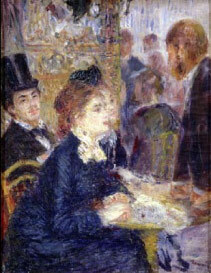 In 1878, Renoir's Le Café, a painting of a young woman enjoying a cup of coffee, was accepted the Salon. In 1879 he showed four more works at the Salon, including Madame Charpentier and her Children, which was hung in a prominent place. Renoir had become friends with the Charpentier family, and in times of need they helped him financially. In return he painted portraits of their family. Madame Charpentier and Her Children became one of his most successful works. Renoir married Alice Charigat at the age of 40. Together they had three sons, Pierre, Jean, and Claude. 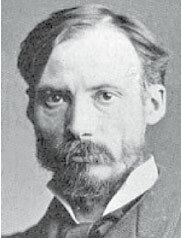 Pierre August Renoir died in France on December 3, 1919. He was 78 years old. He painted even in the last years of his life, when he was bound to a wheel chair with arthritis severely limiting his movement. His vibrant and colorful paintings are among the most well known and most reproduced works in the history of art. 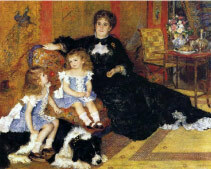 Madame Charpentier and her Children, is a portrait of the Charpentier family, with which Renoir had become friends. The Charpentier family helped him in times of need, and in return he painted portraits of their family. It is one of his most successful works. Le Café is a painting of a young woman enjoying a cup of coffee. 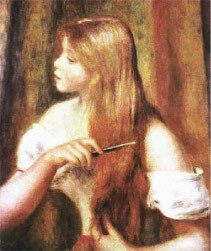 It was Renoir's first painting to be accepted by the Paris Salon. 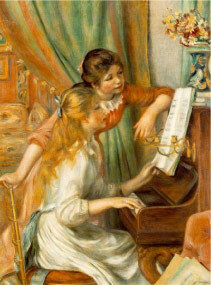 Young Girls at the Piano was created for a new museum at the request of the French Government. It has come to be regarded as one of the most accomplished and engaging scenes of middle class life. 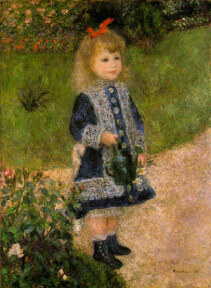 Following a less than successful impressionist exhibition of 1874, Renoir began painting charming, light-filled scenes like Girl with Watering Can in hopes of selling more paintings.